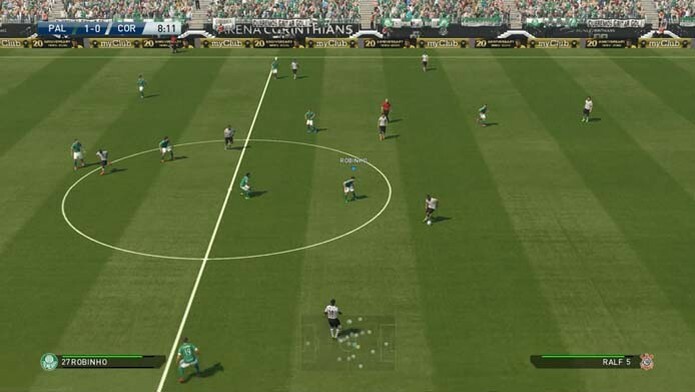 PES 2016 requires a good balance between offensive and defensive plays to win matches. The marking is key part of the game, as it prevents opponent’s goals and also sets the stage for withering counterattack. Check out some tips to score goals in PES 2016, get right in the kick and close the door to opponents using folded marking, accurate tackles, side stands, the goalkeeper outputs and different strategies. Tackles are the most basic defensive function of PES 2016, but are not exactly easy to use. To steal a ball efficiently is to press the pass button twice quickly while next opponent. The big problem is that a small mistake in planning or delay in time to execute the command can cause the opponent to go through your player easily, or even your athlete commits a rough foul. To avoid this, try to stay aware of the exact time to press the button. Seen as violent and unfair moves, the side stands can also be used cleanly as a beautiful way to recover the ball or prevent a goal of the opposing team. For this, try applying lateral or diagonal stands, always with your targeted player to the ball. So it will be much easier to avoid faults and divert to a safer area of the lawn. In addition to pursuing the opponent with a player, you can also press the opponent with another athlete, bringing down the spaces and make the task of recovering the ball much easier and safer. Just hold the shot button while without the ball. But remember that this leaves a gap in their defense, and can be enjoyed by more experienced opponents. Play with the release button pressed while without the ball is a big craze of PES 2016 players, but that's not exactly the best way to take the ball from opponents. The best option is to control their defenders manually towards the opponent, and only then try. So you will better cover the vacant spaces of the field. More than just trying to protect the goal kicking rivals, the goalkeeper may also have an important role in his defense, is moving forward and trying to block the onslaught of attackers using his feet. To advance the goalkeeper, hold Y / Triangle. Beware of balls for coverage, you can leave your keeper without a reaction and result in an easy goal for the other team. Stick the run button to make your supporters arrive quickly to rival attacker can seem like a great idea, but will make players lose much performance throughout the match. In addition, your defenders will also expose to dribble opponents, making it difficult to recover after a feint. Try to control the running time, and avoid pikes as they approach the opponent.